The family room (we wallpapered the walls, put down flooring, and installed trims). I love the curtains and rug in this room -- and the decoy ducks on the mantle! Quite possibly my favorite: View from Dining Room into Kitchen! arranging the kitchen and installing the curtains in there! 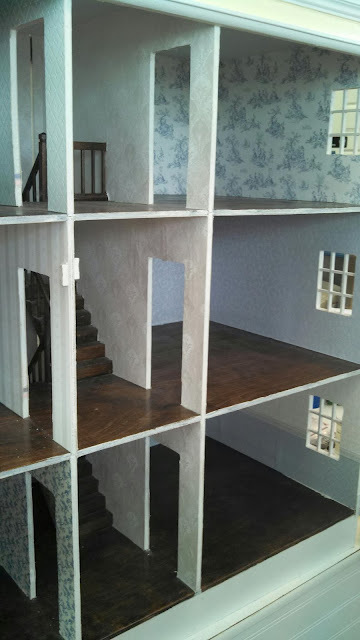 Moving upstairs to the summer porch area . . . . very quaint! and yellow accents: really pops the color on the floor! My first attempt at Paperclay. has actually taken a class and been instructed on how to use paperclay as opposed to me who was just winging it) that I had done it the difficult way: I painted each brick one at a time, including the edges of each brick, then did a dark wash (wiping it away from the tops of the bricks so it would not alter my brick color) to get into the crevices between each brick. Apparently I was supposed to do the dark wash first to get it into the grout and then the bricks just needed to be touched up with paint to give them some color. A much faster approach than painting each brick and edges as I did. But, having had success with paperclay on the smaller project, I used the left-over chunk of it that I had to make the 1795 kitchen floor! I rolled it out and then stuck it in. Then realized that it only filled about 1/2 of the room. I did not know how much time I had before it started to dry out so I quickly rolled out another section and blended it into the first piece. And still was about 3" x 5" too small. So another handful of paperclay was plopped into the roombox! Figured I could roll it out once it was in the room. Which would have been a great idea if the rolling pin fit in the roombox. So I used my hand to flatten it as best I could. 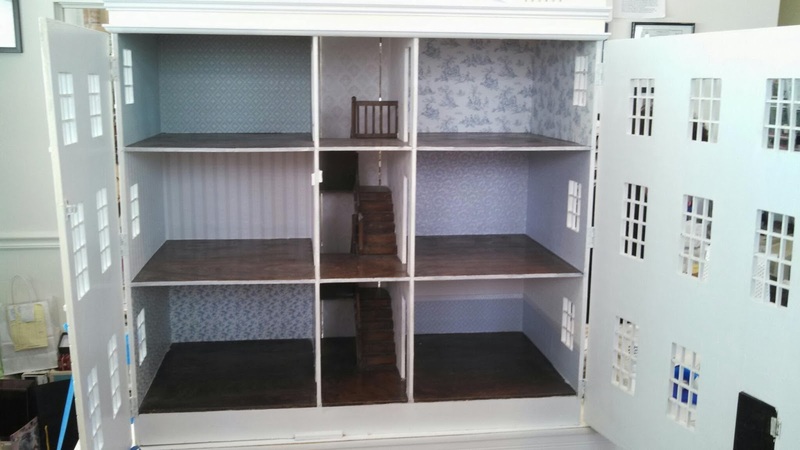 It is not as even as I'd have liked, but given it is a 1795 kitchen, they probably had some uneven floors (although not as uneven as mine, I'm sure! LOL). Then I started creating my bricks . . . . Drawing in my bricks . . . . Seeing it like this (with only a few bricks drawn in) makes me think I could use this to make snow banks on another project of mine! You can see my bumpy uneven parts on the right from the door way to the open end of the room and on the far left as I had to do a touch up spot in that corner where the paperclay was too thin. The empty space on the floor is where my fireplace goes. It's so odd seeing the bricks drawn in but all white . 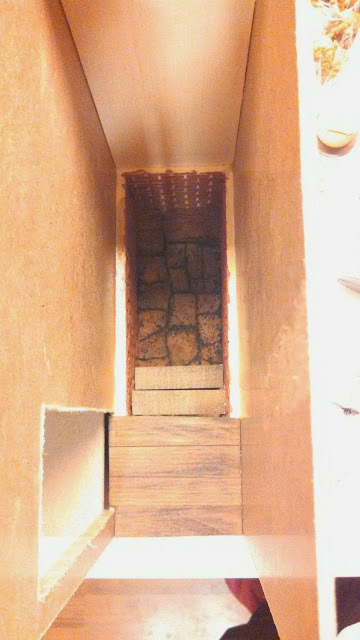 . .
Bricks all drawn in and left to dry for a few days. Next I did the paint wash to fill in my grout lines . . .
Paperclay bricks with just a brown paint wash on them. Then I painted quickly over the bricks with a burnt sienna color paint, slightly watered down in some spots because I wanted the bricks to look faded/old and very worn. Now I have to tackle some electrical decisions (wire it or use battery operated lights like I did in the other 3 kitchen roomboxes? 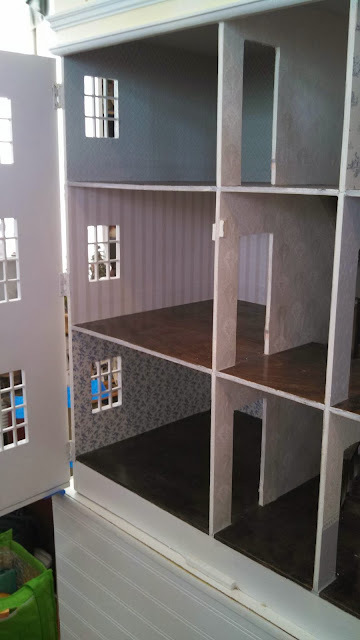 ), decide whether or not to add a window on the left, and then am ready to move on to the walls (stucco white)! Thanks to the snow I had some time to work on my 1795 kitchen roombox. I have a series of kitchens (decorated to be 1795, 1895, 1929, 1963, and 2009). 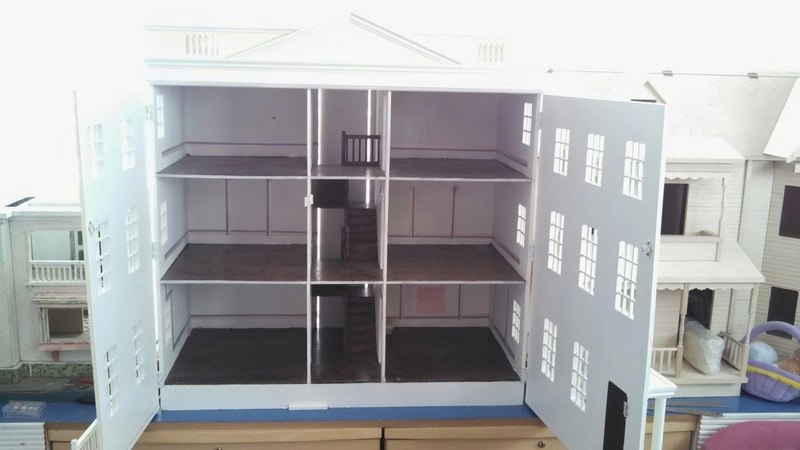 But the 1795 and 1895 kitchens were not yet built or decorated. 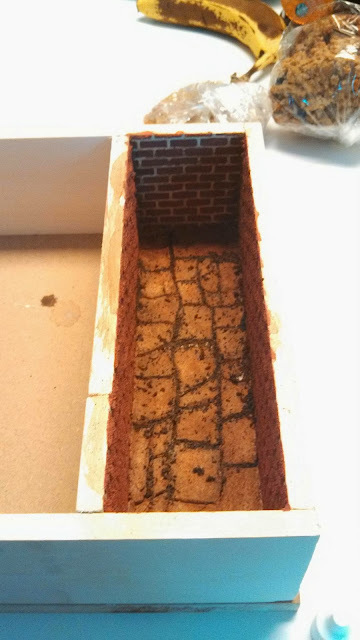 So I used my snow day to work on the 1795 cellar (instead of laundry or cleaning as I should have spent my time). 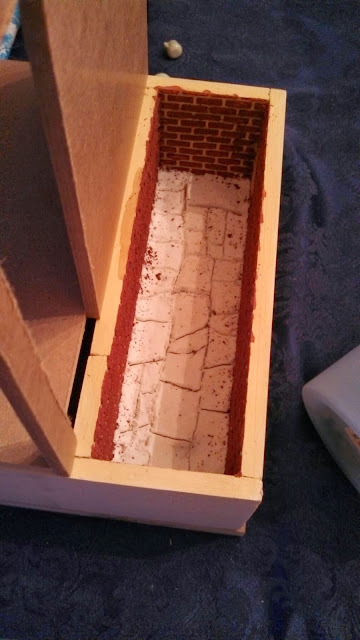 I had to start in the cellar because I figured it would be the most difficult thing to do as it is in a 3" wide space and once the outer walls are glued in place the lower "underground" section of the cellar would be near-to-impossible to reach to finish. Using wall spackle I drew in the field stone flooring in the cellar. After spackle was dry I painted it with a brown paint wash.
and grouted between my stones with "dirt". 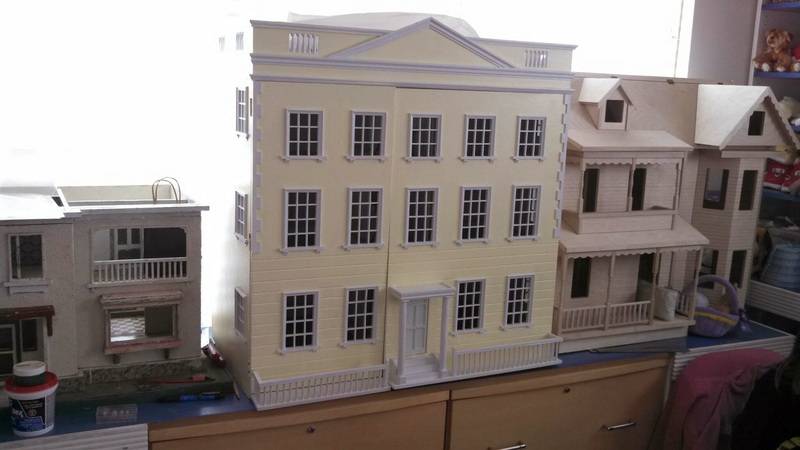 and landing, and finally glued on the side walls. The most entertaining part of it all was trying to reach my hand in to glue in the steps as I stupidly glued the side wall in BEFORE remembering to glue in the steps down there! But, with a cup of coffee and a few choice words, I did it. Next came the ceiling: almost didn't happen as I realized first thing in the morning that I did not have the white paint at home with me (I had left it at work). But I discovered some left over ceiling paper strips from another project I had worked on and decided that would work just as well! The strips were practically the right width needed to fit between my ceiling beams so it all worked out like it was meant to be! Photo of ceiling (photo is upside down - I can't figure out how to flip it right side up). Speaking of making something more difficult: I have never found the right brick flooring that I want for this kitchen (one of the reasons it did not get built and decorated yet). So I am going to make one out of paperclay. Because I love frustrating and punishing myself . . . . but I will pretend like it will be worth it once I finish! 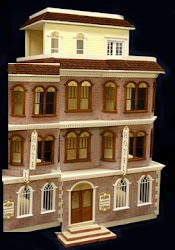 of this front-opening English dollhouse kit. As yet another snow storm moves thru our area, I'm trying to get the customer's Honeychurch finished up. (Luckily I told the customer it would be finished the week of the 11th so I still have another week to work on it. So even if this snow/ice storm arriving late tonight keeps me homebound and away from this dollhouse waiting for me at work (Happily Ever After), I won't be behind schedule.) Ceilings are all papered and 5 of the side rooms are papered. Have paper cut for the 6th room, but wanted to paint over the tapewire the customer installed so it doesn't show thru the thin paper customer picked for that room. 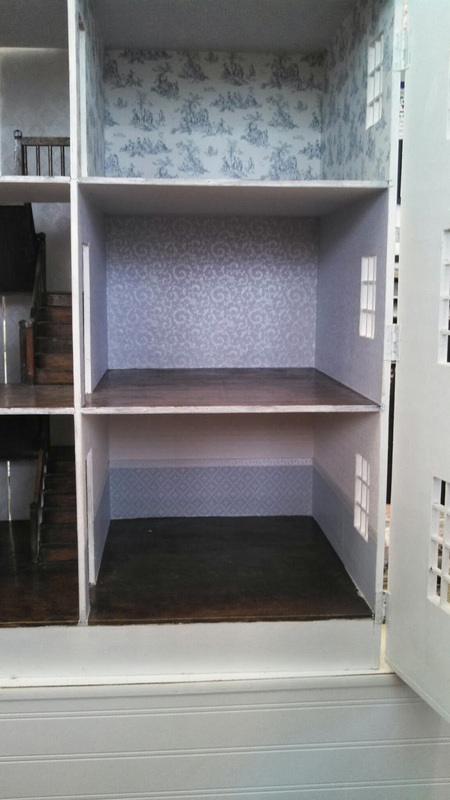 The right side of the dollhouse. but I had to paint over the tapewire first. This week will be spent making templates and papering the center hallways: a challenge as the stair cases meet at landings partway up the rooms' walls and the back wall of the hallway opens on a hinge. Normally I would try to remove the stairs and paper the wall with a whole sheet of paper and glue the stairs back in. But I know from constructing one of these kits before, the stairs are not going to come out nicely. And I wouldn't be able to get replacement pieces if it broke. So I would rather make a template . . . .
room's wall. That'll be fun to paper around. 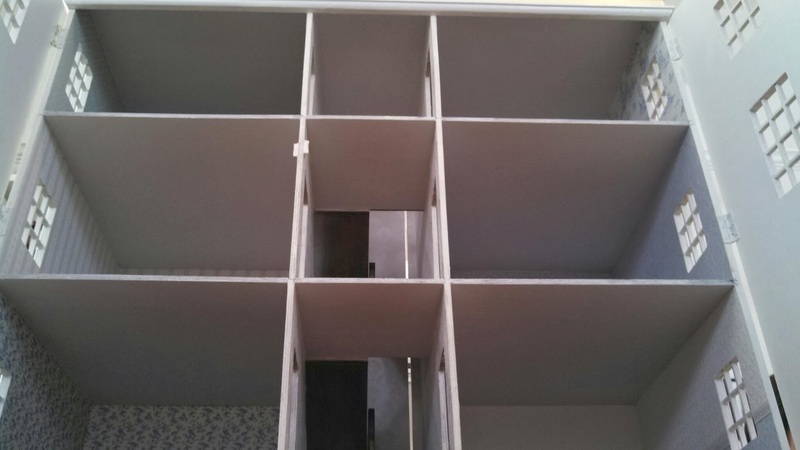 So, while snowed in at home for the next day or two, I'll work on my kitchen roomboxes. 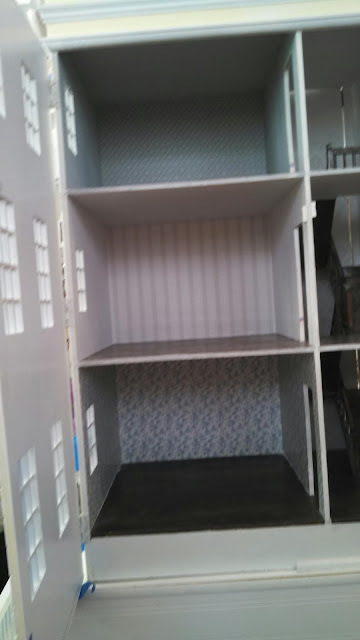 May get the time to paint and install trims, and glue in the curtains in my "1929 kitchen" or I'll paint the brick and fieldstone work in my "1795 kitchen"! Unless I decide to do the responsible adult thing and clean my basement instead.